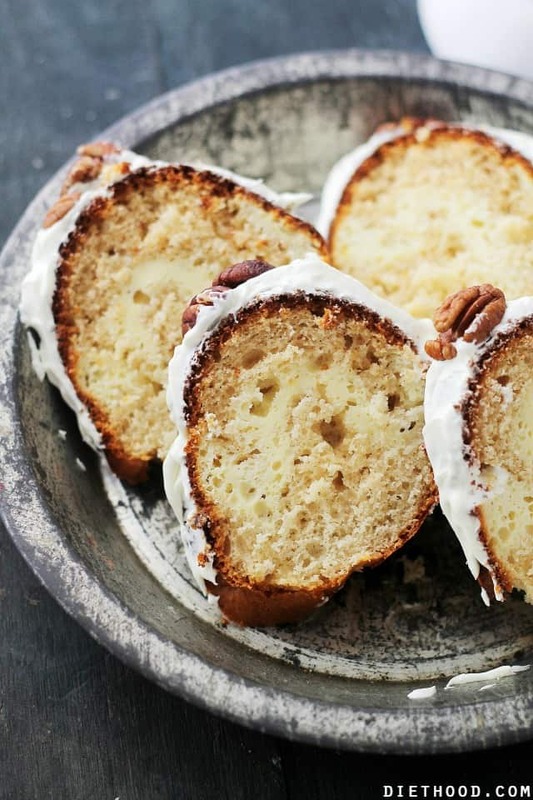 Cream Cheese-Filled Coffee Cake – With a rich cream cheese icing and a delicious cream cheese filling, this is your coffee’s new best friend! Hey, there, friends! Hello, there, Monday! How goes it? I should just let you know right now that I’m still trying to roll out of bed for you. Er! Did I say that out loud? That calls for cancelling our Apple Orchard visit – waaaaaaah! – and opening up a bottle of wine, which will help me tune out the crying kids once I break the news about not picking apples today. WAAAAAAH! I’m also going to try really hard not to turn on the News – I’m a news junkie – but I just don’t wanna hear another peep about Ebola. I already cancelled our winter break trip – there is no way I am getting on a plane before they have this thing sorted out. I think I’m cool with just hanging out here in Indiana. I’ve never loved this landlocked State more than I do right now. We see no tourists, we hear no tourists… rock on corn-state, rock on! Did I just spoil our Coffee Cake moment?! Scratch all the Ebola talk and let’s eat this loveliness until your heart’s content. Coffee + Cake = Life. Yeah. That’s what we need. Coffee and Cake – it’s the cure for all things gone wrong. There’s cream cheese in it, there’s cream cheese on top of it. But, like, really awesome and sweet cream cheese. I can’t.even.handle.it. 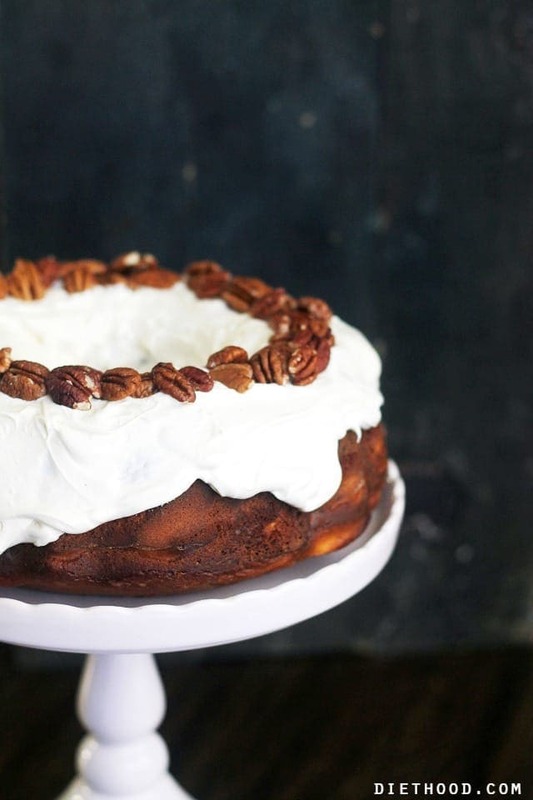 Then the pecans on top are truly the best-est accessory. Crunchy, sweet, buttery… and it makes it look all Christmas-y! Oh, how I love thee!! I suggest you shut off your computer, leave Facebook alone, and go make THIS. Don’t even wait for the weekend. Don’t even wait another hour! For the LOVE of CAKE, AND COFFEE or TEA, just DO IT! With a rich cream cheese icing and a delicious cream cheese filling, this is your coffee's new best friend! 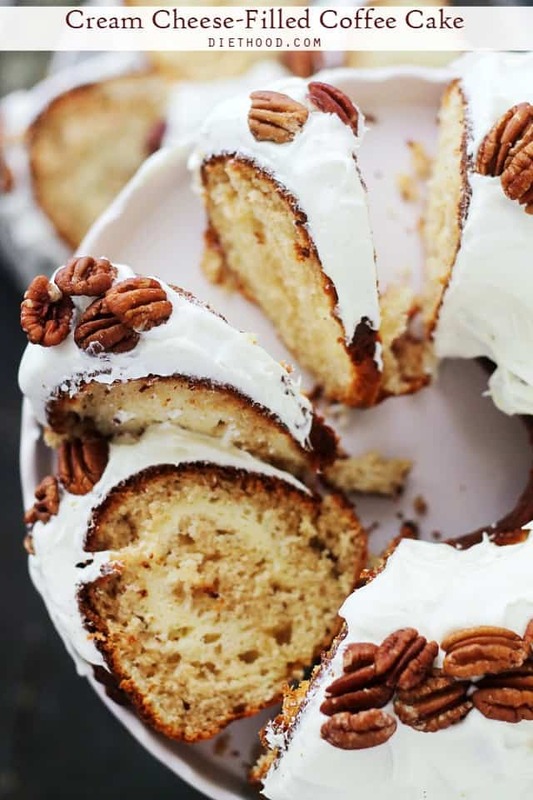 Grease a 9-inch bundt cake pan with butter and sprinkle with flour; shake off any excess. In a medium bowl, whisk together flour, baking soda, baking powder, cinnamon and lemon zest. Set aside. In your mixer's bowl, cream together butter and sugar; beat until creamy. Beat in yogurt and vanilla and continue to mix until thoroughly combined. Pour half of the cake batter in the prepared cake pan and using an offset spatula, spread the batter evenly and smooth it out. Set aside. Prepare the Cream Cheese Filling by combining all ingredients in your mixer's bowl; beat until smooth and thoroughly combined. Drop the Filling by the spoonfuls over the cake batter. Top with the remaining of cake batter, and using an offset spatula, spread the batter evenly and smooth it out. Bake for 40 to 45 minutes, or until a toothpick inserted in the center comes out clean. Remove from oven and let cool 10 minutes in bundt pan. Carefully invert cake onto a cooling rack and let cool 30 minutes before icing the cake. In your mixer's bowl, combine the powdered sugar, heavy cream, cream cheese, water, and vanilla; beat until smooth, adding more water if needed, until the icing is spreadable. Spread the icing over the cake and allow to set for 20 minutes. 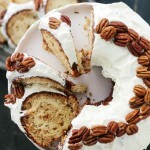 Add pecans on top of cake. 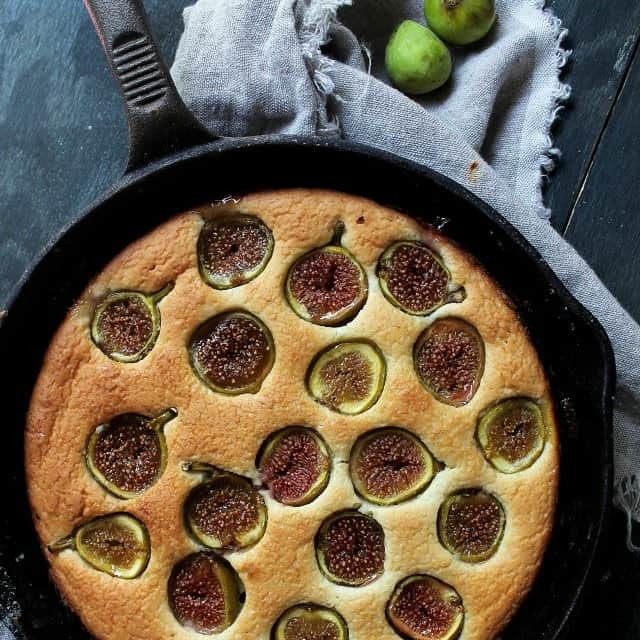 Fig and Lemon Cake – INCREDIBLE!! 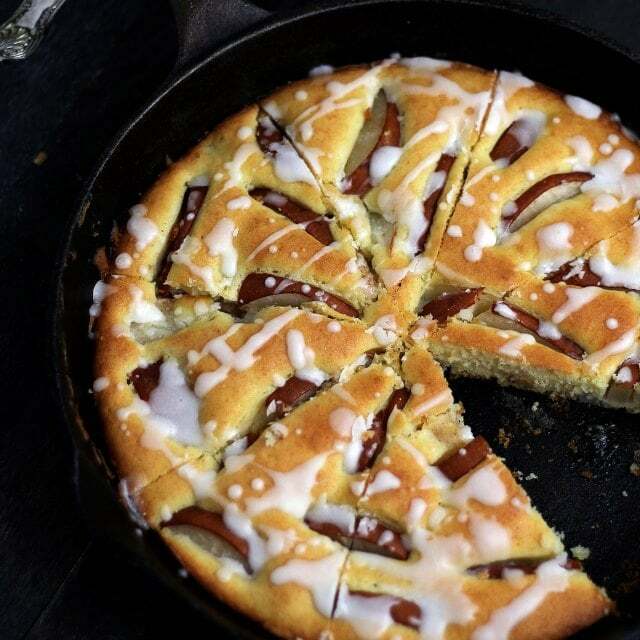 Pear Cake with Lemon Glaze – SO GOOD!! Found your recipe on Pinterest and Am planning to make it for brunch. Question,Can I make it in advance and does it need to be refrigerated? I substituted applesauce for the oil and xylitol for almost all of the sugar in this recipe and it was delicious. I served it with crushed walnuts and cubed mango for a wonderful Sunday brunch. Thank you! Edited to add: I’d give it five stars but the page won’t allow it – I cannot click that fifth star! Isn’t that odd? This is a fantastic cake, absolutely love it! A double dose of cream cheese? Yes please. Oh and don’t even get me started on the news. I can barely watch it anymore. I just want to bake this cake. So delicious! I’m sitting here drinking my coffee in my pi’s wishing I had a piece of this cake. Thanks for the recipe! Wow, I wish I was tasting a bite of this cake right now! Yum. What a beautiful cake, Kate! I bet it tastes great, too! 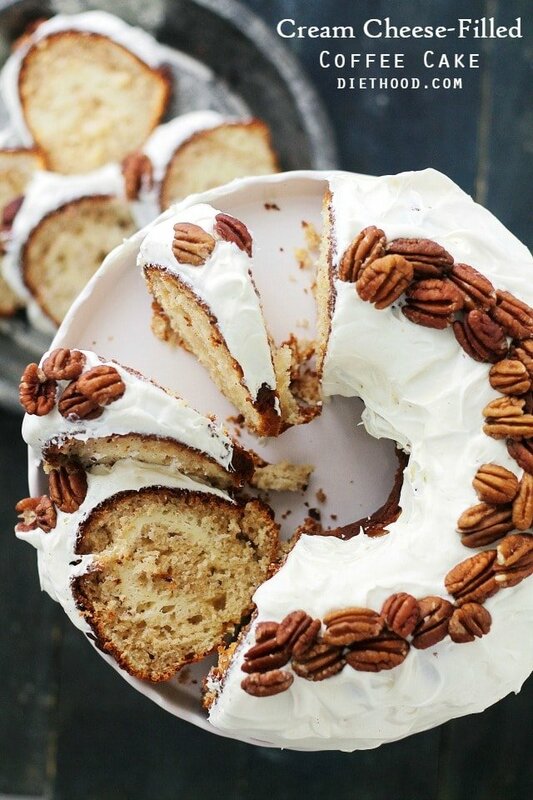 This is the most beautiful coffee cake I’ve ever seen, stunning!! One word: gorgeous. Oh, and: WANT! !